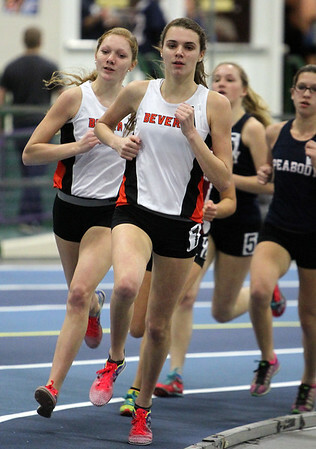 Beverly sophomore Abby Walsh, right, and senior Julianna Wesley, left, lead a pack of runners during the girls mile race at the NEC Conference Meet at the Reggie Lewis Center in Roxbury on Friday afternoon. Walsh and Wesley came in 1-2 respectively for the Panthers. DAVID LE/Staff photo. 1/30/15.